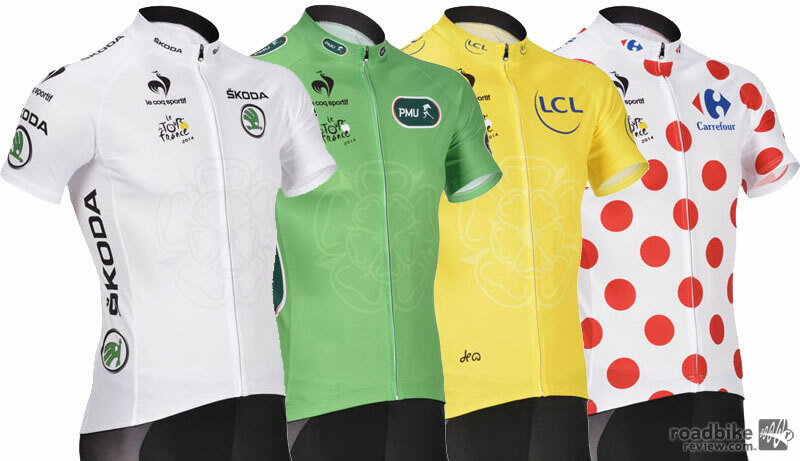 While casual fans are generally aware that the leader of the Tour wears a yellow jersey, they may not be aware of the other jerseys available. So today, I’m going to break down the various categories in the Tour. How You Get It: Well, I pretty much covered this in the first column so you can just go there and check it out. One thing not mentioned in that column is the determination of group time. If a group crosses the finish line, everyone in the group gets the same time. So if, let’s say, 40 riders cross the finish line in a group, there may be an actual time difference of 20-30 seconds between the riders at the front and the riders at the back, but everyone in the group gets the time of the riders at the front. The reason for this is safety. Rather than having a hundred or more riders jostling for position at the front and almost-certainly causing an accident, the riders just have to stay attached to whatever group they’re in. As long as there is not a demonstrable gap between one rider and another, they are considered part of the same group. Contenders: In this case, you can go back to the second column and check it out. How You Get It: Unlike the GC, the Points Classification rewards riders for their actual finish in a stage, with the most points, obviously, going to the winner. It’s called the Sprinter’s Jersey because the greatest number of points are awarded on flat stage finishes that tend to favor the sprinters. Fewer points are awarded for wins on mountain stages or time trials. The jersey was created in the 1950’s to attract more sprinters to the Tour. There are also smaller points awarded for intermediate sprints during certain stages. In some cases, this encourages riders to break away from the peleton (the main body of riders) in order to pick up points for the Green Jersey. How You Get It: Nearly every climb in the Tour is categorized by its difficulty and placement on the stage. It starts with Category 4 and gets more difficult as the numbers get smaller, ending with the HC (hors category or beyond categorization) climb, the most difficult of the Tour. Points are awarded based on the rider’s place and the category of the climb. A Category 4 climb, for example, awards one point, only to the winner of the climb. The amount of points and number of finishers awarded points goes up with each degree of difficulty, topping out with the HC climb, in which the winner gets 25 points and the top 10 finishers are all awarded points. If a stage ends at the top of a climb that’s Category 2 or greater, the points are doubled. Contenders: Rafal Majka is the defending King of the Mountains champion and a two-time winner. He is likely to be in the mix this year. Thomas de Gent is a past King of the Mountains winner (2012) and an aggressive rider with a love for breakaways. Thibault Pinot is a gifted French climber who seems to have given up his ambitions to win the GC and will instead concentrate on stage wins. Since those wins would likely come in the mountains, it’s not hard to figure out which jersey he’ll contend for. How You Get It: This one’s not hard to figure out. The white jersey goes to the rider who’s 25 years old or younger and is highest-placed in the GC. Easy-peasy. Contenders: Simon Yates, twin brother of last year’s winner, Adam, is a good climber who’s shown (via his 6th place finish in last year’s Vuelta a Espana) that he’s ready to become a GC contender. Louis Meintjes, last year’s runner up in this category, is a formidable climber, looking for another Top 10 (or better) finish overall. Emanuel Buchmann was third in last year’s competition and is steadily improving. He won the young rider category at the Criterium du Dauphine and appears to be in good form. The Rainbow Jersey: this signifies the defending World Champion. Peter Sagan, the World Road Race Champion, will wear the Rainbow Jersey at every stage except time trials (unless, of course, he’s wearing the Green Jersey.) Tony Martin, the World Time Trial Champion, will wear the Rainbow Jersey at the time trials. National Champion Jerseys: If a rider has won their home country’s national championship, in either the road race or the time trial, they will wear a specially-designed jersey bearing their country’s colors. As with the Rainbow Jersey, a national road race champion will wear the special jersey at all stages except the time trials and the national time trial champion will wear the special jersey only at the time trials. Most Combative Rider: At the end of every stage, the judges will award a Most Combative Rider prize. There’s no real criteria for it, but it usually goes to a rider who has distinguished himself by leading a sustained breakaway or attacking repeatedly. When a rider is given this prize, he gets to wear a special red number the following day. Team Classification: The GC times for each team’s three highest-placed riders are added together. The team with the fastest three riders overall is the winner of the Team Classification award. During the Tour, this is tracked by the leading team wearing special numbers with a yellow background.